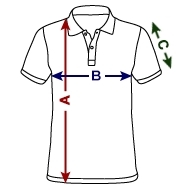 This close-cut two-button polo shirt is made from 160g/m² cotton. The fabric is smooth jersey, instead of piqué. Featuring our BG&G Heart on the left of the shirt.